MorningStar Tooling in California makes a machined from billet aluminum lubrication injector for freehubs. With just the axle pulled back half way out of the hub, the Free-Hub Buddy is pushed into the outer end of the freehub. A hole in the center of the FH Buddy serves as the injection point for either oil or grease. Two holes at the bottom of the seated FH Buddy allow the lubricant to flow into the top of the bearing assembly within the freehub body, and forces the old lubricant to exit around the base of the freehub where it can be wiped away. 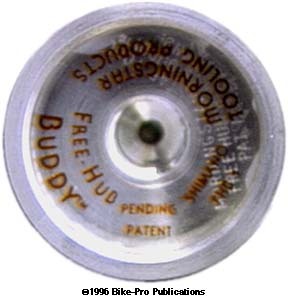 The freehub Buddy comes with two adapters, using no adapter allows many grease tubes to thread directly into the Freehub Buddy. One of the adapters allows aerosol cans to be the source of either lubricants or cleaners. The other adapter lets needle grease guns, (Goose Greaser, Finish Line, Pedros) to be used as the source of lubrication. The alternative to using this tool is the tedious job of taking the many small parts apart and hoping that you can fit the parts under pressure back together again. 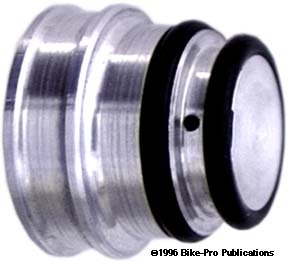 The FHB-1 model is for Shimano freehubs, the SHB-4 model is for Suntour freehubs made for the 1991 model year to present. SRP makes hollow Titanium axles as replacements for the steel ones that come commonly in production Shimano or Suntour hubs. The axle used in all Shimano & Suntour front hubs is hollow, with a 9mm outer diameter and a 5.3mm inner diameter with a 100mm length when measured from the outer edge of the lock nut to outer edge of lock nut, (over lock nut dimension). The rear axle used in most Road hubs is hollow, has a 130mm over lock nut dimension, with a 10mm outer diameter and a 5.3mm inner diameter. The axle used in new Mountain hubs at the moment has a 135mm over lock nut dimension, with a 10mm outer diameter and a 5.3 mm inner diameter. The SRP Ti version is an exact replacement for these, with threads cold rolled into the axle. Ti hub axles is something they have pursued beyond the common, and they make Ti replacements for the Campagnolo hubs. The Campy front axle replaces the same one used in the Campy Chorus, Record and Record OR, having a 9mm by 1mm by 100mm O.L.D. The Campy Freehub rear version will replace the axle used in the Campy Chorus, Record, Record OR or the aluminum body Super Record. These are the best cone wrenches generally available and used by the service departments of many stores including ours. Made of thickly chrome plated steel, these are thin enough to use ion any of the hubs reviewed in this article. 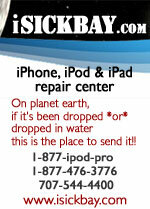 Made in the USA in 7 sizes, 13mm, 14mm, 15mm, 16mm, 17mm, 18mm, and 19mm. The wrenches have a Blue vinyl grip. Park makes a double ended cone wrench that has a thin cone wrench on each end. Made in the USA in 4 sizes, they come as the DCW0 which has an 11mm and 12mm end on one wrench. The DCW1 has a 13mm and 14mm end on one wrench. The DCW2 has a 15mm and a 16mm end on one wrench. Or the DCW3 which has a 17mm and a 18mm end on one wrench.